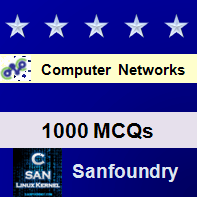 This set of Computer Networks Multiple Choice Questions & Answers (MCQs) focuses on “Access Networks”. 1. Which of this is not a constituent of residential telephone line? Explanation: The third part is ordinary two way telephone channel. Explanation: The same company which provides phone connection is also its ISP in DSL. Explanation: The DSLAM located in telco’s Central Office does this function. Explanation: Cable modem termination system is used in cable internet access. Explanation: Hybrid fiber-coaxial (HFC) is a telecommunications industry term for a broadband network that combines optical fiber and coaxial cable. Explanation: In cable access analog signal is converted to digital signal by CMTS. Explanation: Active optical networks are essentially switched ethernets. Explanation: StarBand was a two-way satellite broadband Internet service available in the U.S. from 2000–2015. Explanation: Home Access is provided by DSL, FTTP, Cable. Explanation: ONT stands for Optical Network Terminal. The ONT connects to the Termination Point (TP) with an optical fibre cable. Explanation: Because DSL is made of twisted wire copper pair.